December 11, 2017, Brooklyn, New York—This Holiday season, Surprise the Struggling Inc., Gift Giving Extravaganza will be a Surprise Holiday Dinner for 380 people (100 families) at the Star Bright Family Center in Brooklyn, New York. Festivities take place on December 16, 2017, from 2 PM – 6 PM. In its second full year of service, Surprise the Struggling, Inc. is gearing up for one of its momentous end of the year Holiday Surprise Parties. Executive Director, Dr. Jacquelyn Wilson and #SurpriseTheStruggling staff and its Ambassadors, plan, host, and execute several functions throughout the calendar year to help surrounding communities, as well as several global communities, in addition to their philanthropic endeavors each day of the week. #SurpriseTheStruggling™, INC. is a 501 c 3 organization that aids those in both local and global communities that are in need. Their primary consumers are the less fortunate, homeless women, and teen girls. Yet, their reach is far extending, including men, children, and families. 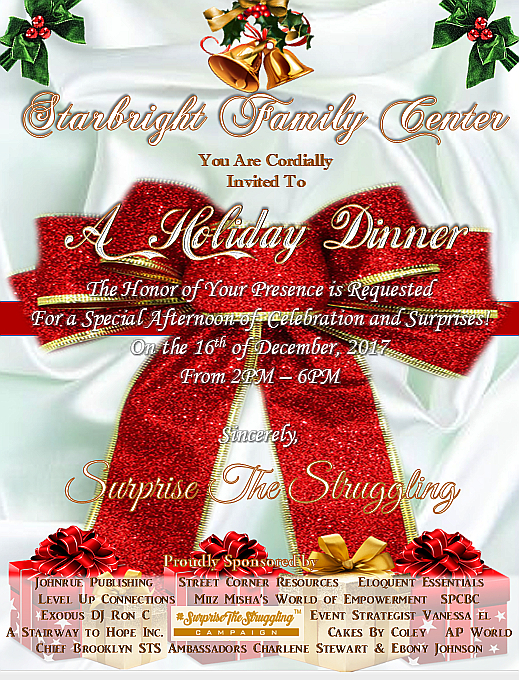 This Saturday’s surprise event will be a day of celebration, fine dining, and surprise gift giving for all the residents of Star Bright Family Center. #STS desires to surprise these hard-working individuals and families, encouraging them this holiday season with a surprise dinner with all the trimmings to celebrate their milestones and in recognition for all the hard work they are doing to change their life circumstances. Thanks to generous sponsors and donors, all 380 residents of Star Bright Family Center, in Brooklyn, New York will experience a catered Holiday meal with all the trimmings, including dessert. In addition to the very special meal, #STS and Executive Director, Dr. Wilson, will be surprising residents with gifts for the Holiday season. Surprise the Struggling extends its gratitude to the following businesses who are sponsoring the Surprise Holiday Celebration for more than one hundred families in need. Johnrue Publishing, Street Corner Resources, Eloquent Essentials, A Stairway to Hope Inc., Cakes By Coley, AP World, Level Up Connections, Miiz Misha’s World of Empowerment, Exodus DJ Ron Coleman, SPCBC, The Event Strategist, and Chief Brooklyn #STSGLOBAL Ambassadors Charlene Stewart and Ebony Johnson. Profound gratitude and appreciation are given to these wonderful corporations and individuals who have made this year’s Giving Extravaganza possible.